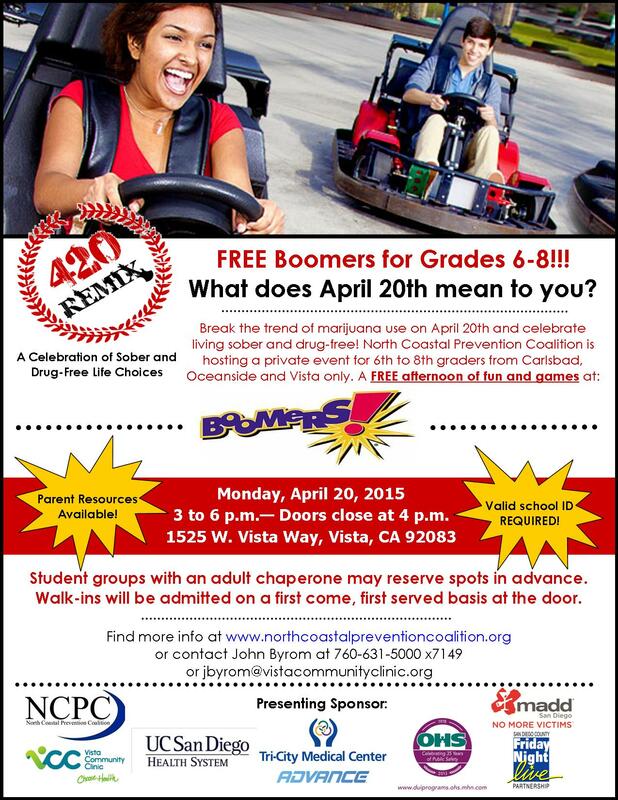 For more than a decade, NCPC has sponsored the positive, drug free event on April 20th – a day considered an unofficial marijuana-smoking holiday by many in the drug culture. 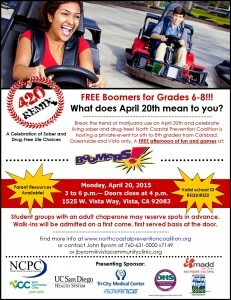 The event is open to middle school students from Carlsbad, Oceanside and Vista and provides drug-free fun with free entrance to Boomers! Information and resources will be available for both parents and middle school students. MADD, with support from Nationwide Insurance, developed the Power of Parents® handbook to encourage parents to start ongoing conversations with their kids about the dangers of underage drinking. The guidelines – including open communication, setting clear expectations, and following through with reasonable consequences – are equally effective in preventing youth marijuana use. The handbook is presented by trained volunteers in a brief 30-minute workshop. WHY: Youth marijuana use has been on the rise since 2009. Fewer youth believe that frequent marijuana use is harmful to them and more youth report using marijuana in the past month, according to the California Healthy Kids Survey. Marijuana is addictive and unsafe, and the adolescent brain is particularly susceptible to THC’s harmful effects that can decrease teen’s mental capabilities over time. ← Should Alcohol be Allowed at Movie Theaters?